ROME, GA - Greenville's offense finally broke through against the Rome pitching staff on Saturday night, scoring six runs early and navigating around a Braves comeback attempt late while securing their first win in the four game series at State Mutual Stadium. Rome starting pitcher RHP Trey Riley had some strong moments during his outing but got in a jam in the 4th inning. He departed with Rome down 2-1 and the bases loaded with two outs. Reliever Alan Rangel entered the dangerous spot and surrendered consecutive singles to Drive hitters Juan Carlos Abreu and Grant Williams, making it 6-1 Greenville. Down five runs the Rome bats stirred. The Braves got two tallies across in the Bottom of the 4th on an RBI single from Jose Bermudez and a sacrifice fly off the bat of Darling Florentino. Slugger Griffin Benson powered up with a two run homer in the 8th inning to pull Rome to 6-5 but the Braves were unable to get all the way back. The tying run did reach base in the 9th inning but was stranded at first. Reliever LHP Jake Higginbotham was strong out of the bullpen for Rome. He threw two scoreless innings and struck out five Greenville batters. The Clemson alum allowed two hits and walked no one. He has yet to allow an earned run this season. Once again, both Logan Brown and Trey Harris went 3-4 against the Drive. Brown hit a double and Harris a triple on Saturday. Justin Dean was 1-4 with an RBI double, a walk and a stolen base. Benson now has a team-leading three homeruns this season and two in the Greenville series. Saturday's bomb was the switch-hitter's first from the right side of the plate. 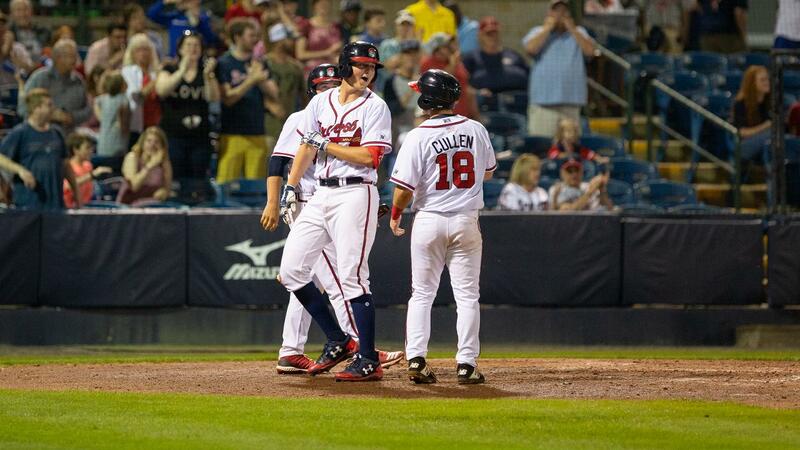 The fourth and final game of the set between the Rome Braves and Greenville Drive is scheduled for Sunday afternoon at 2 pm from State Mutual Stadium. Rome will start RHP Odalvi Javier and Greenville will put RHP Brayan Bello on the mound.